Dear Ladies, Thank You is an evolving performance that has been presented in several variations (see bwllow). The common thread that connects all versions is the discourse of the underrepresentation of women in art history, art theory, art institutions, and in the broader collective memory. The content and the visual aspect of the performance vary according to the context within which it is presented, and according to the gathered findings of previous performances. One of the issues that have become apparent in the previous performances is the need of a permanent monument. Consequently, the central aim of the new performance will be to produce a permanent mark during the performance. In this performance I pronounced the names of women and queer artists that I has previously learned by heart. At the same time I wrote them down on the floor of Metelkova with a permanent spray. 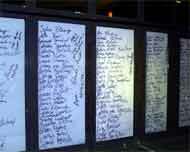 All of the names were of artists who have presented their work at one of the Red Dawns festivals. With this action I wanted to permanently mark the Metelkova area, and create a monument both for the Red Dawns, in specific, and for feminist and queer art in general. Metelkova is also characterized by other spaces and organizations that deal with similar topics. This is why I symbolically linked them all with the line of names of the women artists in question. On one hand, the line marked Metelkova space as one of those places that carry a rich history of organizations, groups, and festivals, and which have been, and still are, dealing with the social status of women and other invisible groups, LGBTIQ in particular. The performance began at the Trg brez zgodovinskega spomina (Square with No Historical Memory) in front of Menza pri koritu. Dear Ladies, Thank You is an evolving performance that has been presented in several variations (see above and bwllow). After having the performance in Ljubljana, I was invited to perform again in Zagreb. The third performance was presented during a feminist conference entitled REDacting, TransYugoslav Feminisms: Women’s Heritage Revisited. In Zagreb the performance was presented outdoors in the street Prolaz sestra Baković, which was named after two sisters who fought against fascism.The location was chosen in accordance with Red Min(e)d curatorial collective (Danijela Dugandžić Živanović, Katja Kobolt, Dunja Kukovec and Jelena Petrović), who organized the artistic event alongside the REDacting feminist conference. They entitled it Bring In Take Out – Living Archive, which was dedicated to feminist art in (post)Yugoslav space. We have chosen this location because there are very few streets in general that are named after women and this street in particular was interesting since in 1990s the street lost the names of the Baković sisters. It was replaced by a male name, but fortunately it received back the original name in 2009. 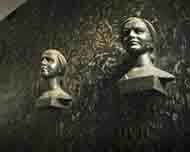 The area where the performance took place was placed directly in front of the busts of the two sisters, which seemed as they were observing the event. Because of the context of the conference and space I decided to re-analyse the learned names. 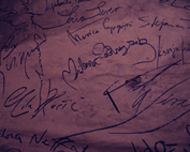 For this occasion, I added to the 126 name additional artists from the region of ex-Yugoslavia. I made these changes because of the context of the space, and event, it was presented in. In total the new memorized artists were 148. Beside this, the performance consisted of many of the same elements and technology that were used for the performance at Kapelica Gallery. However, some of the elements (like camera and projection) were removed and some things were alternated. In the case of the performance in Zagreb, no names of the male artist were mentioned, only the female artist were the subject there. When searching for artist from this region an informative fact is also that the information about this artists were much harder to find. Artist from the ex-Yugoslavian space are even more likely to be forgotten by the art history and theory. The performance Dear Ladies, Thank You was made in one other versions in 2011 which was presented on my master defence presentation in the Academy of Fine Arts in Ljubljana. This version tried to address the problem of radicaly low number of women professors in this school. However this performance was not documented. The performance Dear Ladies, Thank You critically addresses the issues of (in)visibility of women artist in the art world. Instead of addressing my critique directly to the public sphere, and instead of analysing statistical facts about the presence of women artists' works in contemporary art institutions, or the presence of women artists in art history books, art critique text etc., I have taken myself - my memory/knowledge as a criterion and object of analysis. The reason for analysing the personal memory/knowledge was the comprehension of the subjectivity as a construction of public, political, and social sphere. My thesis was that the examination of ones memory, her/his knowledge and behaviour, could reveal deeper structures and underlying ideology of the society the particular subject is part of. The performance Dear Ladies, Thank You was made in various formally and conceptually different variations. The variation in Kapelica Gallery in Ljubljana was the second one. The beginning of this performance started long before the actual event, when I wrote down on a piece of paper as many artists' names as I could think of. By doing this 'memory test' I came up with 126 male artists names and 34 female artists names. After learning that such a small percentage of the artists I remembered/knew, were women, I decided to make a statement about this problem by learning the same amount of female artist names by heart (as I knew of male artists) and make a representation of this act in a performance. I chose to act on the imbalanced state in the art world by radically shaping and balancing my own memory. 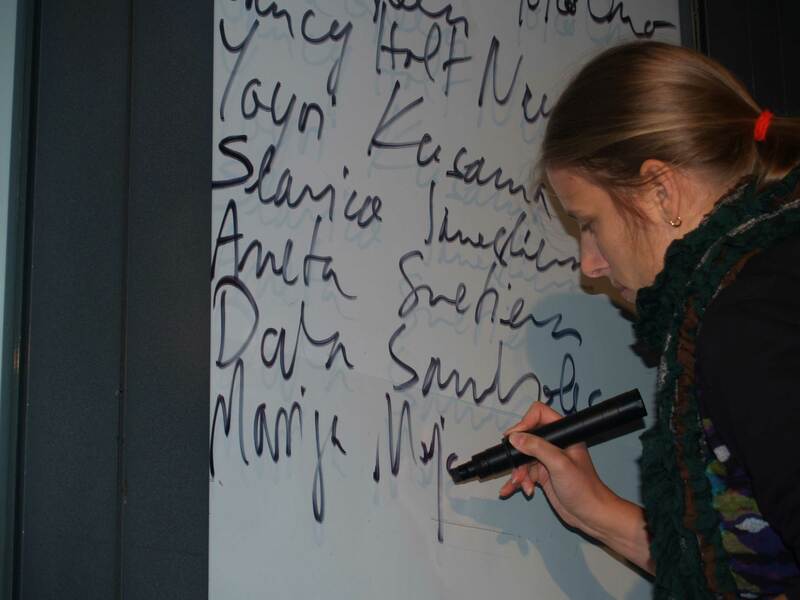 For the performance in Kapelica Gallery I learned 126 names of women artists in a predefined order. When looking for new female artists to learn I tried to look for artists who once were known or should now be known because of their achievements. Beside their names I also learned basic facts about their work and biography. 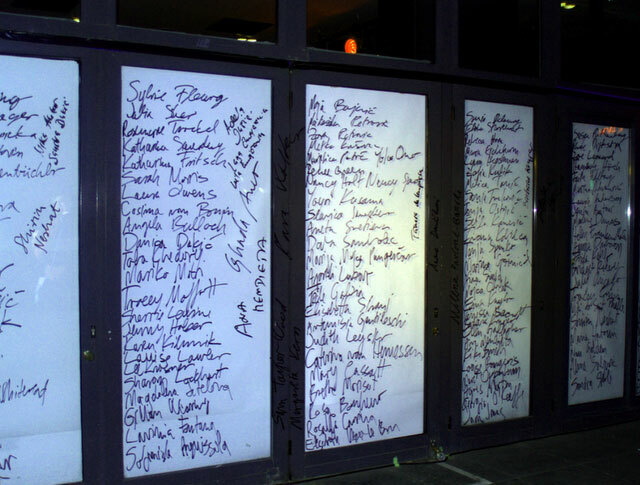 The names of 126 male artists were written on the gallery floor before the beginning of the performance. During the performance, I spoke out the names of the 126 female artists I learned, and at the same time wrote their names down on the floor, filling this way the empty gaps between other (male) artists. The performance also involved using a head-mounted wireless camera that constantly filmed my face, a projection that showed the image of my face true the perforation of the artist's names and dynamic lightning of the space that reacted to the speed and quantity of my writing. The technology was used to convey the idea about the issue of forgetfulness of art history and art theory. 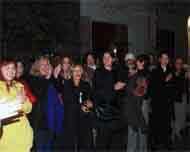 The third version of the performance was again modified and prezented in Zagreb. More about this version is written bellow. 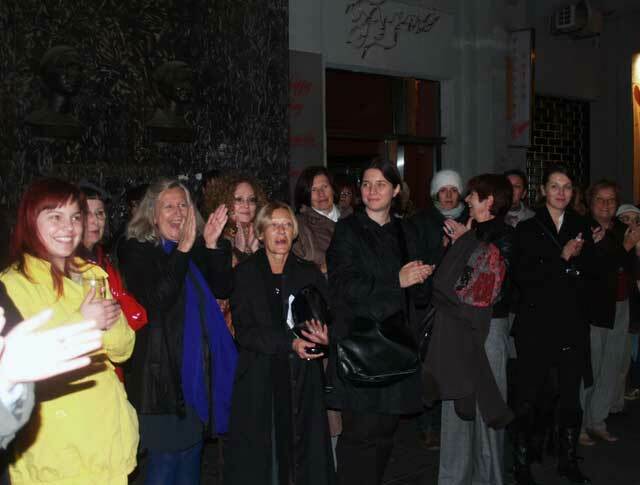 First presentation of Dear ladies, thank you in 2009 was presented at the Academy of Theatre, Radio, Film and Television, Ljubljana. New radicly modefied versions were presented in 2011 and 2013 (see above). The topic of the multimedia performance was dedicated to female artists from the past and their lifestyle which was usually really hard and consisted of a lot of self-discipline and sacrifices. On top of their tough life and extra work they continued doing what they were striving for, they also many times encountered periods of loneliness and desperation. The performance was an homage (or rather femage) to three chosen Slovene artists for their strength of will and their extraordinary life stories, and to remember how different were the circumstances for women (artists) in the past. The dance for this project was developed during the classes of Art of Movement at the Academy of Theatre, Radio, Film and Television (professor Tanja Zgonc) and was accompanied with two videos, one on the left and one on the right side of the stage. 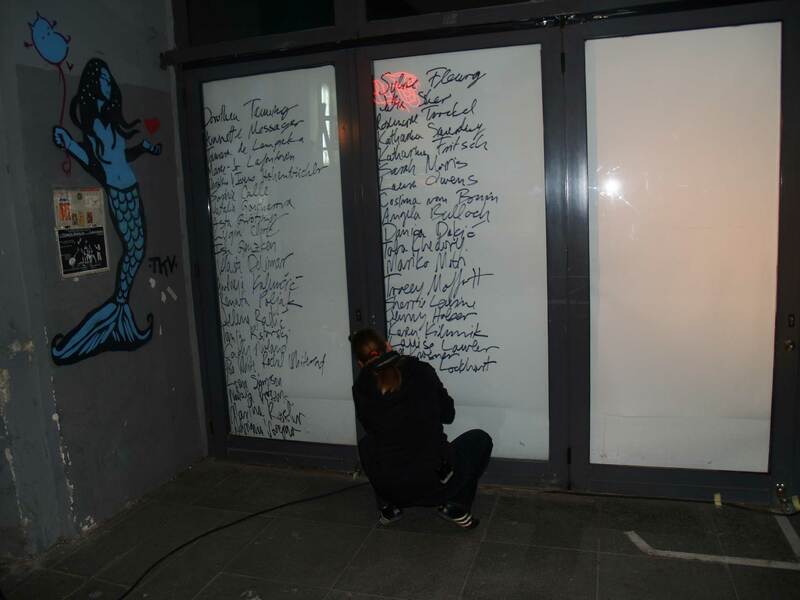 The stage floor was covered with names of many Slovene female artists (painters, sculptors, writers etc.). 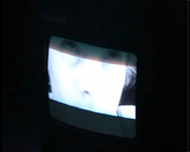 One video output was showing inserts from one of the three artists' life and the other video was connected to a camera. 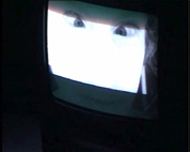 The camera was positioned in front of my face, so the spectators were always getting a real-time footage of my face. In this way I tryed to show a connection between my work and lifestyle with their lives and was at the same time thanking them for their strength and their works of art they left behind. The dance on the written signatures of the female artists was a metaphoric expression of women solidarity and understanding of the great impact our social positions have on our work and life.